One of the larger challenges content and inbound marketing folks have is simply getting answers. Whether it's approval on content, strategy, or design - the path to completion usually involves a number of meetings, calls and iterative steps. 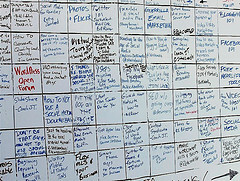 An approach you may want to consider to streamline some of these activities is a marketing design session or event - especially at the start of a content marketing program. A design event or session is typically a half or whole day tightly facilitated meeting with very specific outcomes focused around your content plan and goals. It's a useful way to combine what tends to be a lot of individual calls and reviews into a larger session with key players and sponsors. The value of having all these decision makers in a room for a half or whole day is that you have the ability to achieve buy-in and do revisions and iterate the revisions all with real time feedback. Whether it's building a content calendar, identifying subject matter experts or defining a review process - completing these sort of activities individually can sometimes take weeks or even months. The potential downside of a one day design event, however, is that if you are not 110% prepared or your agenda is not tightly wrapped around desired content outcomes you run the real risk of alienating sponsors throughout your company. So be sure your event planning is air-tight and goal focused. This is not an exhaustive list and you may want to consider a series of design sessions as you ramp up and grow your content program. But remember, design events are your chance to shine and show your stuff with all the key people in the same room together. Here are some key success factors to think about when you are planning your design event. Know what you need from each attendee - validation, confirmation, time commitment etc. Document, document, document - capture whiteboards, ideas and etc. Provide participants with a mapping of key decisions and next steps within a few days of the session. Come prepared, come with a plan, and know what outcomes you need and your one day content design session will reap rewards for months and weeks to come.